Four-wave mixing (FWM) is one of the major optical fiber nonlinearities in dense wavelength division multiplexing passive optical network (DWDM-PON) transmission system. To improve its performance, the relationship between FWM and some factors, such as dispersion, channel spacing was investigated theoretically. An analysis model for the FWM is proposed, which consists of the single-mode optical fiber and dispersion compensator. 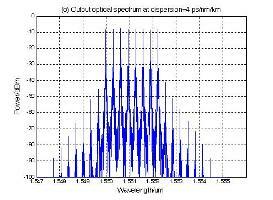 The eight channels DWDM-PON downlink transmission system at 50 GHz channel spacing has been simulated. The changes of the four-wave mixing and its effects on each channel are quantitatively investigated through measuring optical spectrum, bit error rate (BER) and power penalty at different settings of dispersion. The results show that FWM can be decreased with increasing the optical fiber dispersion coefficient, when the optical fiber dispersion coefficient is increased beyond 6 ps•nm-1•km-1, FWM will gradually be replaced by dispersion which is becoming the major limiting factor in DWDM-PON transmission system. The influence of FWM on each channel is different, where the intermediate channels are more vulnerable than the boundary channels.